* NATO STANAG, M1913 Military Standard and Weaver type scopes. 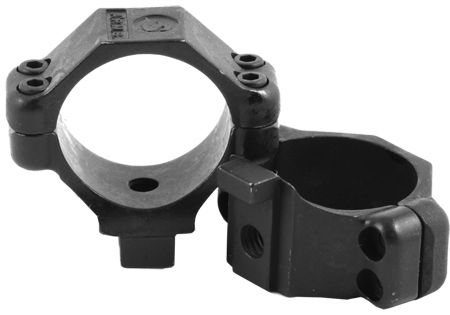 The finest scope mount designed for the M16A1/A2 rifle. This mount features the A.R.M.S.®/SWAN® Universal mounting platform, accepting NATO STANAG and Weaver type scopes and rings. It attaches via a unique self-locking thumbnut that fits snugly in the hole in the carry handle for continuous zero hold. 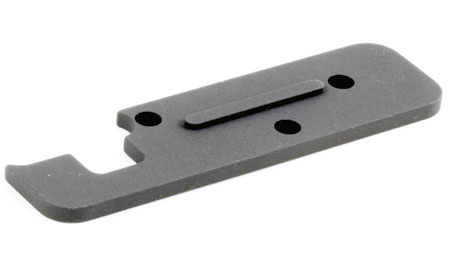 The #02™ carry handle mount features a wide angle TV shaped see-thru channel for use with iron sights. Also fits detachable carry handle models. 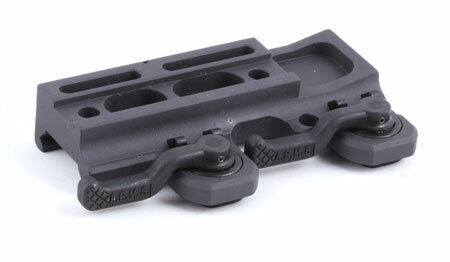 This is a longer version of our widely used #02™ carry handle mount. It measures 6.5" long and attaches via a unique self-locking thumbnut that fits snugly in the hole in the carry handle for continuous zero hold. The #02™ extended carry handle mount features a wide angle TV shaped see-thru channel for use with iron sights. A.R.M.S.® #3 The A.R.M.S. FN FAL standard and paratrooper are precision machined to military specifications. This mount replaces the existing dust cover and offers the user a rigid mounting base with NATO standard weaver rail and Picatinny rails. This mount with fit L1A1 and FAL rifles. Manufactured from aluminum extrusions with steel attachment rails riveted in place. The exceptional rigid alloy body provides a rock solid platform for even the largest optics. * Self locking captivated thumb nuts. * Accepts Standard #22 Dovetail Rings & A.R.M.S.® #21 STANAG rings. One of the most versatile mounts on the market. Made of extruded aluminum with a Mil-spec black hardcoat. The #5 Multi-base is a Quick detachable, multiple eye relief mounting base that attaches to weaver type rail and flat-top receivers. The Multi-base is compatible with both weaver style rings and NATO STANAG mounts. It raises your sight platform 3/4" and features a spring loaded clamping bar and self locking captivated thumbnuts for solid, zero movement mounting to your existing rail. 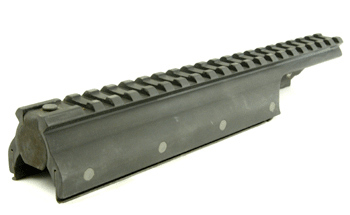 The #5™ Multi-base also features a see through channel for use with iron sights. Also available with Throw Levers® - see #63. 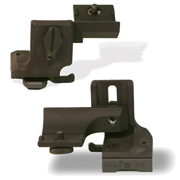 Converts NATO STANAG mounts to A.R.M.S.®/SWAN® (aka Mil-Std. 1913) rails. Mil-spec hard coat finish. For additional eye relief considerations, the rail provides two positions of fastening, via two securing screws (included), which allows the rail to extend to the rear or front. 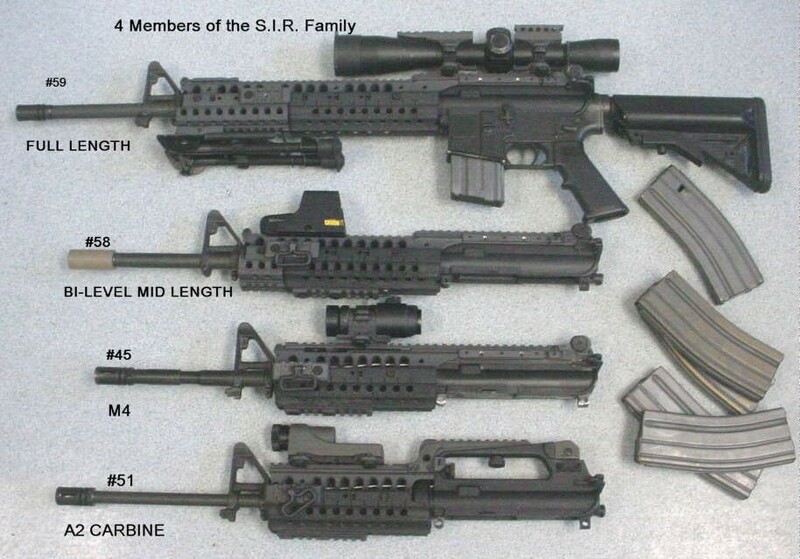 A.R.M.S.® #7 Converts NATO STANAG Scopes to Weaver type rail. 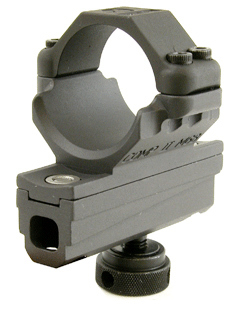 The #7™ is a quick detachable, multiple eye relief mounting base for optics using the NATO/STANAG mounting system. It features a spring loaded clamping bar and self locking captivated thumbnuts for solid, zero movement mounting to your existing rail. 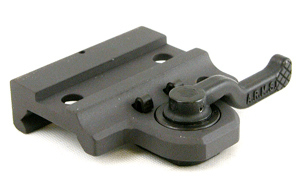 The #7™ base allows you to mount NATO STANAG scopes to weaver type rails and flat-top receivers. 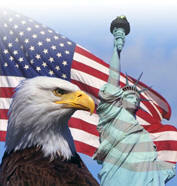 * Accepts NATO STANAG, M1913 Military Standard and Weaver type scopes. 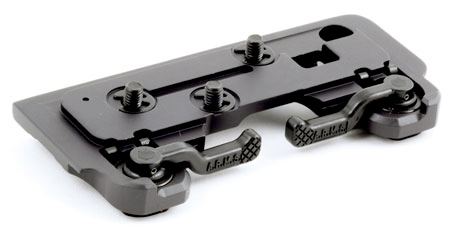 Multi-position channel mount with self-locking thumbnuts. The #10 mount is extremely rugged and versatile. 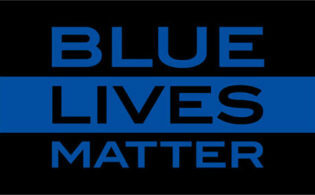 The finish is MIL-SPEC black hardcoat, and provides the eye relief options needed for many weapons. A.R.M.S.® #11 Fits the Aquila and Raptor N.V. optics. A.R.M.S.® developed the #11™ Adapter at the same time it developed the housing interface used on the Aquila and Raptor Night Vision Optics. It fastens to the A.R.M.S.® #2™, #5™, #7™, and #19™ mounting brackets. Engineered to provide the optimum combination with the New Leupold Multi-Fastened CQ/T Optic. The fast action of the optic is enhanced by the quick on/off of the MIL-SPEC throw levers and provides a rugged no nonsense system of the future. A.R.M.S. 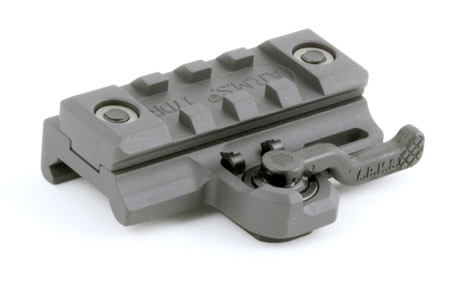 has succeeded in developing an ultra low profile mounting platform for the Trijicon® reflex sight. The #15 platform is attached to the bottom of the sight by 3 screws that are supplied with the platform, and provides 2 positive locking throw levers with A.R.M.S.® patented no-mar buffer pads, no gunsmithing required. The #15 Reflex mount platform meets or exceeds all mil-spec requirements just like all other A.R.M.S.® standard mil-spec products. Reflex Mount Spacer - Adds a little height to the #15 mount. The #16A allows for the mounting of the Aimpoint M2/ML2 & other Comp. 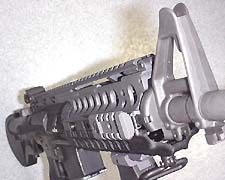 sights to be mounted directly to the carry handle of the AR-15/M16/M16A1/M16A2/M4. 30mm ring mount. 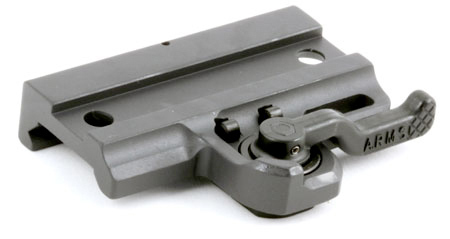 The see through design allows for use of iron sights with the mount in place. * Steel locking foot and lever on the left side. 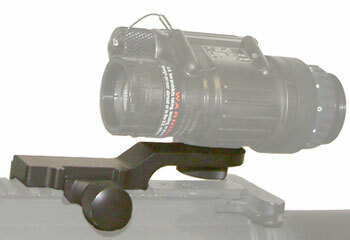 * Secure LASER/Night Vision Optic attachment at 2 points. * Repeat Zero Hold with easy on and off. Steel locking foot and lever on the left side. Dual Throw Lever® Mount attaches to the Surefire® Flashlight M900 series. The dual Throw Lever® mount for the Surefire® Flashlight M900 series to attach to a Mil-Spec 1913 rail, providing a more secure mounting option than a single Throw Lever®. Throw Lever Dove Tail Mount - This mount is perfect for converting accessories over to the Throw Lever System, such accessories include the Insight Technology, Inc.® M3 Tactical Illuminator or M6 Tactical Laser Illuminator. Repeat Zero Hold with easy on and off. Developed by A.R.M.S. ® as a small compact universal platform. The #21 Rings are all steel with a Mil-spec phosphate finish for ultimate surface protection. Phosphate finished Pair). A.R.M.S.® #22 Throw Lever Rings - All Steel 30mm Ring, secured with A.R.M.S. dovetail system to an extruded aluminum platform. Build in no mar Patented Buffer Pads. Available in Low, Medium, and High heights. ARMS-22LOW Low Rings .925" .30"
ARMS-22MEDIUM Medium Rings 1.15" .56"
ARMS-22HIGH High Rings 1.45" .81"
* S Ext Length 14"
Modeled with the same well-mannered concept as the rear sight on the SWAN Sleeve System. The new A.R.M.S.® S.I.R.® System offers more features than any other. 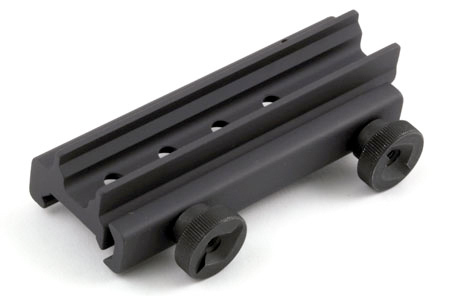 This System allows you to place Dovetail Rails where you want them, not where others decide. Tired of dealing with hot, uncomfortable Dovetail Rails? No other system keeps the weapon as cool during firing. A.R.M.S.® designed the only free float barrel that does not require the barrel to be removed for installation, like on-tube designs. Neither model requires any modification to the carbine except removal of your current hand guards and the Delta ring on the military S.I.R. (TM) model. The S.I.R. (TM) works with any type front sight. No special tools are needed to install. A simple coin can be used. The S.I.R. (TM) System accepts multiple accessories tailored to the needs of the user and was built to fit Mil-Spec flat top receivers from Colt, Armalite and Bushmaster in the 5.56 carbine lengths. Other flat top receivers may fit properly, but no guarantees or warrantees on any S.I.R. (TM) on any flat top receivers other than those listed above. The modular receiver sleeving system is a hand guard universal mounting system that keeps the barrel completely uninhibited while offering a solid lightweight platform. This allows you mount virtually any accessory like Thermal Imagers, Lasers, Night Vision, Optical Sight, M203, etc.